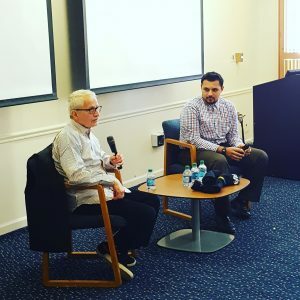 The third and final of our LST Honoree Speaker Series – a chain of interviews with previous winners of our prestigious Leadership and Service in Technology award – took place on Wednesday April 19, 2017, and featured Pace University alumnus and Seidenberg advisory board member Mike Zbranak interviewing the incredibly charismatic Austin A. Adams. Austin was recognized for his leadership and service in technology in 2006 at one of the highest-grossing iterations of our annual fundraisers in its history. We were delighted to welcome both Austin and Mike back through our doors and they were equally as happy to join us. Moderator of the discussion, Mike Zbranak is the Managing Director and Deputy Chief Information Officer of Chase Consumer & Community Banking at JPMorgan Chase. It was time for the discussion to get underway, which Mike kicked off by asking Austin what drew him into technology. It was through this exposure that Austin began to see how important technology was to a company. He now touts it as one of the most, if not the most, important departments in any business. The long-standing problem, however, has been that businesses still refuse to see IT departments as anything other than an unfortunate necessity, here to fix computers so the real work can get done. He spoke about business orientation bias, which is what a business’ motivations are based on what it is trying to do, how it is trying to make money and serve its customers. Typically, technology does not factor very much into these plans. However, by understanding the business’ motivations, the technology department could start taking steps towards contributing meaningful work that would get it recognized as integral to a better business. Referring to the students in the room, he said: “Technology and you as a tech pro have an opportunity to leader change. You may not get your name on it, or get your name recognized in the WST or within the company, but there is no job family in any company that I’m aware of that knows as much about the company as the IT department. You possess all the meaningful information in the company. The conversation continued towards different types of change, namely keeping up if not getting ahead in an ever-changing world. Mike spoke about his observations during the start of his career at JP Morgan. Much of innovation can be found in consolidation. Mike spoke at length about his experiences coming into businesses and finding far too many processes, programs, and options when just a few would suffice. At JP Morgan, the business was so customer-focused that there were 970 services when Mike took over – Amex had three. When Mike asked his new team what they could reduce their services by and nobody responded, he told them “we’re going to have 10.” By consolidating hundreds of services into just 10, the business began to operate far more smoothly. Innovation can be looked at as efficiency; it adds effectiveness. Innovation can be a life-changing moment, but it’s also incremental because it’s made up of small improvements. For example, Craigslist was an innovative site when it was created, but then people took what Craigslist was offering – goods and services – and made apps from it. Uber exists as a combination of existing taxi businesses and the ordering online concept. 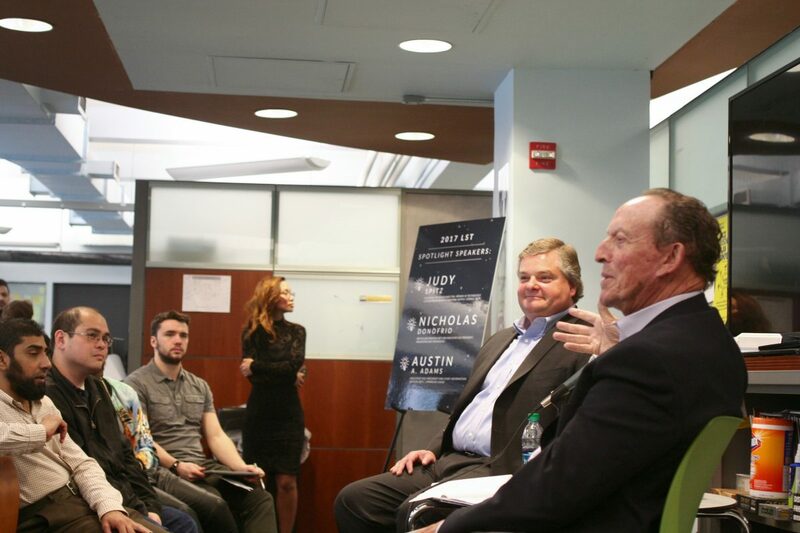 “At some time in your career, you’re going to see pieces of information that’s going to show that something needs to be done better,” Austin said. Peer feedback. Work in any company, and your boss only has so much time to give you feedback. If you quickly get your head around creating dialog with a peer of yours so you can say “Jack, I want to succeed and I want the company to succeed; I’d like to get constructive criticism from you. I’ll buy you a beer every few weeks if you’ll sit down with me and give me feedback. Most people won’t do it, but some will and you’ll get extraordinary feedback. We are never in reality the way we see ourselves. Getting that outside perspective is crucial. You’re going to work with people who have skills and knowledge that you want to develop. Mike is one of the best technologists I know, but when he was new to a senior CI role he worked on developing his skill. If you go to people who have the skills you want to develop and ask for 15 minutes for them to explain how they got to where they are, most will say yes. This is a real way to accelerate your learning process. Think hard about what an extra hour a week would do for you if you spent it learning about the company. It may be more fun to spend the time at leisure, but if you spend an hour or so spending your discretionary time learning about your profession and the business it will help you get so far. After the discussion between Mike and Austin, there was a brief Q&A session followed by time for the students to chat with our guests in person. We’d like to extend a massive thank you to Mike Zbranak and Austin A. Adams for taking the time to visit us and look forward to seeing you at the LST Awards and in the future! 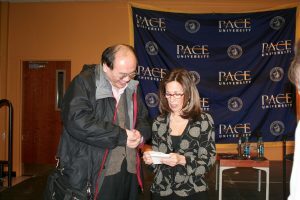 The second of our LST Honoree Speaker Series took place on our Westchester campus. Butcher Suite was looking mighty full as a crowd of Pace students, staff, faculty, and our alumni and friends at IBM stopped by to listen to our spotlight day’s speaker, Nick Donofrio. 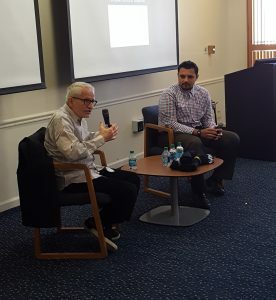 Similar to the previous LST Honoree speaker event with Judy Spitz, the format was interview style, with Seidenberg student Christian Nahshal (BS in Information Technology ’17) taking the stage alongside our guest. 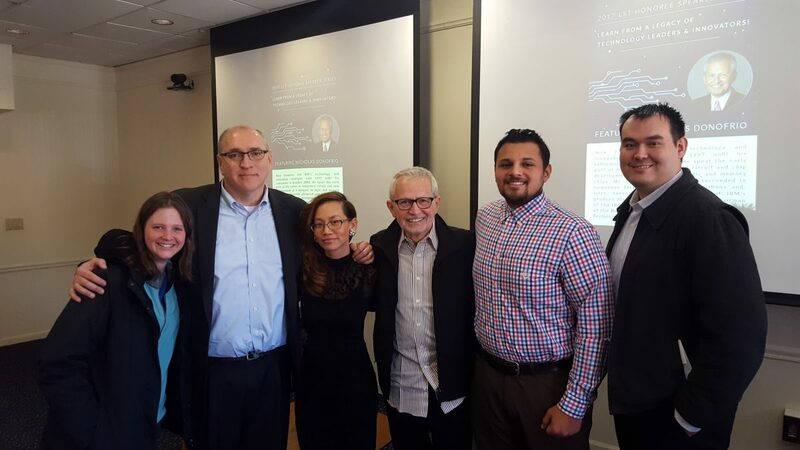 What followed was a fascinating conversation, where our 2013 LST Honoree, Nicholas Donofrio, shared his incredible insights, experiences, and wisdom. Nick Donofrio led IBM’s technology and innovation strategies from 1997 until his retirement in October 2008. He spent the early part of his career in integrated circuit and chip development as a designer of logic and memory chips. In the years that followed, he advanced and succeeded in numerous technical management positions and, later, executive positions in several of IBM’s product divisions. Notably, he was vice chairman of the IBM International Foundation and chairman of the Board of Governors for the IBM Academy of Technology. One of the first things Nick spoke about was what he gained from doing co-op assignments with IBM while he was at college. “I can’t say enough about co-op assignments, this idea of work study,” he said. One of the best things about doing relevant work while studying is that it helps cement theoretical learning with practical training. Nick also spoke about how important it was to get and maintain technical skills. Even though the higher up the ladder you go the fewer technical skills you typically use, it’s important to try to stay technical as long as you can. He also introduced the concepts T-shaped and I-shaped personalities, and the importance of practicing the behaviors and traits of a T-shaped person. An I-shaped person is one that is an expert in one area and does not (and therefore cannot) solve problems outside of their field. However, if one takes the time to advance their knowledge in related areas, they spread their field of expertise – become T-shaped – and can apply a broader range of knowledge to solve different problems. Expanding your area of knowledge also means you can connect two disparate ideas and create new things. “When you intersect things that don’t normally, or never have been intersected, you become an innovator,” said Nick. “It also allows you to explore the gaps,” finding new ideas within existing areas of knowledge. “How do you bring that into a leadership aspect?” asked Christian, bringing the conversation around to Nick’s experiences in executive positions. “Focus on how value is created, where, and how it is created,” Nick said. A good leader should see the strengths and weaknesses of their staff and assign them tasks and roles that allow them to work to their greatest strengths, individually and within the team. Christian then asked about what Nick considers to be one of the most important successes of his life. “You have to know your limits and your abilities, but that doesn’t mean you stop asking the questions,” Nick responded, and went on to recommend reading up on the Medici family who were around in Renaissance Florence. They were a very rich and powerful family who brought around the beginning of the industrial revolution. “They were T-shaped,” Nick said. “They thought about combining this craft with that craft,” which exemplifies the king of T-shaped thinking described above. There was a final question – what was Nick’s favorite project? When the survey results rolled around, Nick was dismayed to learn that he’d received a 1.2 out of 5 – from a team of people he considered his close friends. However, the more time he spent ruminating on his management style, the more he realized that perhaps he hadn’t been the best manager he could be. In fact, as his background had been doing the same job as the rest of the team, he realized that he’d spent the last year continuing to do that job, a job that wasn’t his any more. 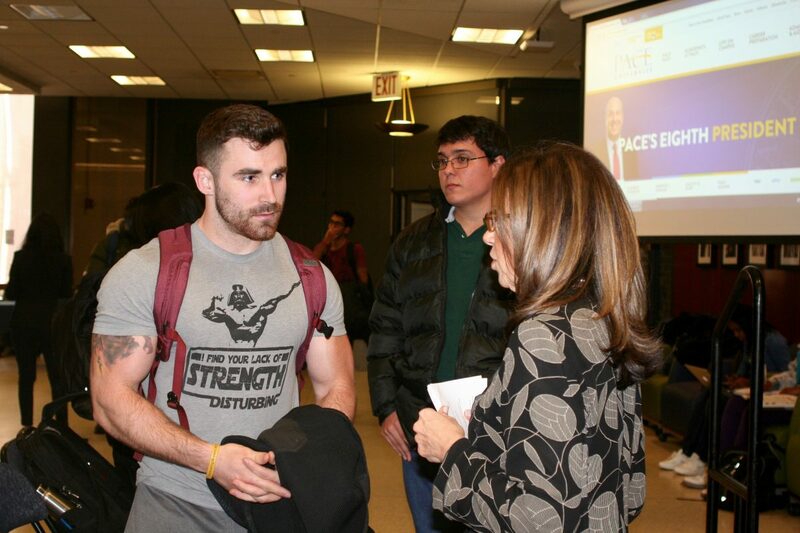 Following the Q&A, Nick stayed behind to chat with students and meet the community. We would like to thank Nick for spending an incredible couple of hours with us and for sharing the amazing stories and lessons he has learned over the years. The final event in our LST Honoree Speaker Series will be held on April 19th, with guest speaker Austin A. Adams. RSVP here! This is the third in a three part post covering the Judy Spitz’s incredible interview with Seidenberg student Niamh Fitzsimon. The event is the first in a series featuring previous winners of our prestigious Leadership and Service in Technology (LST) award. Tickets for the LST Awards in April are available now! The event was rounded off with a brief Q&A session. 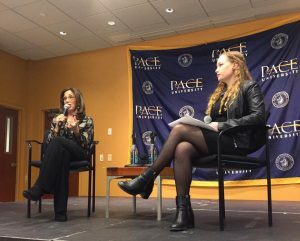 Judy had excellent responses for our students, such as Ava Posner’s (BS in IT) question about her motivation for making a path for women. Another question was about the hardest hurdle Judy has come up against. She immediately demonstrated her finesse with her first step to success – being able to tell a good story. “At one point in my career, I oversaw the organization that delivered software to the networking engineering organization within Verizon. The network organization is the engine room in a company. The guys- all guys – who ran that organization were all engineers from the south. These were guys who were working for the phone companies their whole lives. They were older than me and they were true blue engineers. Well, in walks Judt Spitz with her PhD! I didn’t know anything about engineering or networking and I was supposed to be the partner that helped deliver the software. They had no interest in working with me. It took me a long time to figure out how to get past that. Another question came back to women in technology. One of our students, Kendra Jackman, asked if Judy had thoughts on why fewer women are interested in tech careers, or why they choose not to pursue them. Finally, Judy rounded off the session by answering a question about leadership. “The most important thing about leadership is to understand that it’s a relationship. It’s a relationship between you and the people you want to follow you. It’s about them, not you. Judy’s last remark was to advise everyone to surround themselves by leaders who act the way described above as they will learn from their habits. 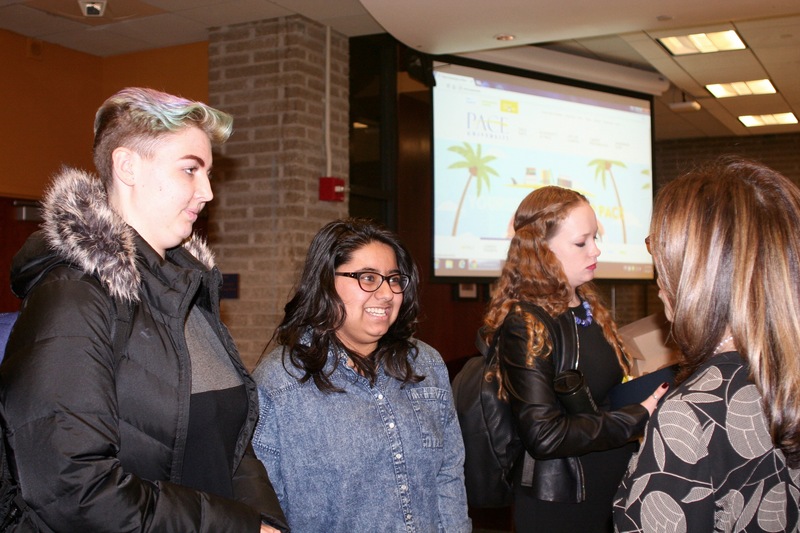 The event was closed off with a raffle for a $100 gift card, which was won by student Rachel Gonzalez – congrats, Rachel! Coffee’s on you, right? 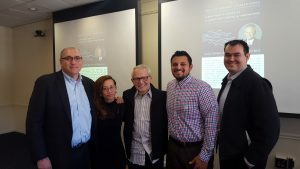 This was the first event in our three-event series, with the next taking place on March 22nd with Nicholas Donofrio, IBM Fellow Emeritus (Ret.) 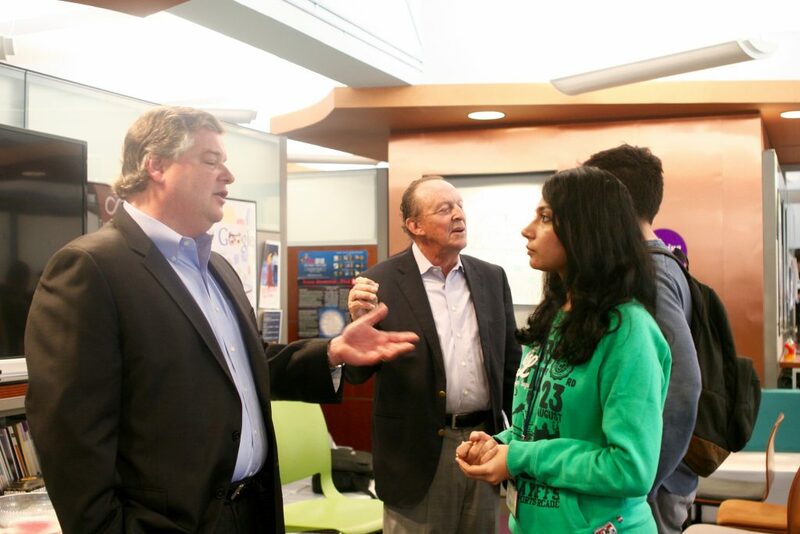 IBM Executive Vice President, Innovation and Technology, on our Westchester campus. The final event will be an interview with Austin A. Adams, Executive Vice President and Chief Information Officer (Ret. 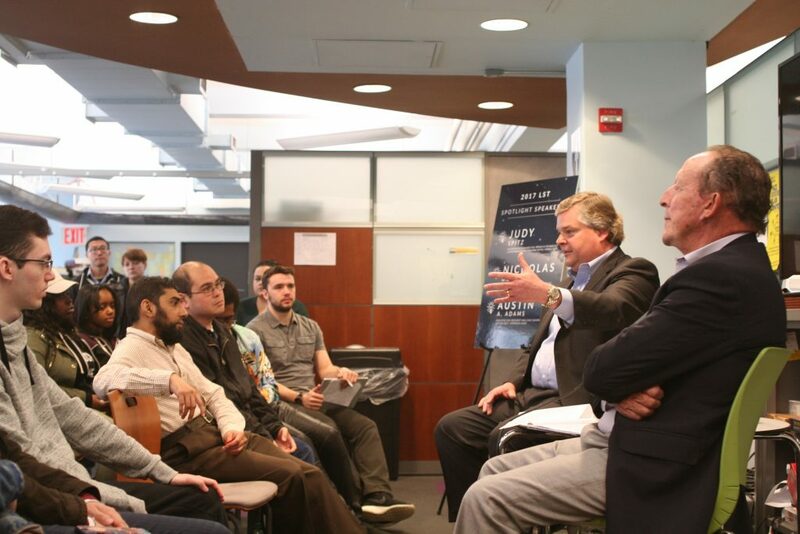 ), JPMorgan Chase, at our NYC campus on April 19th. 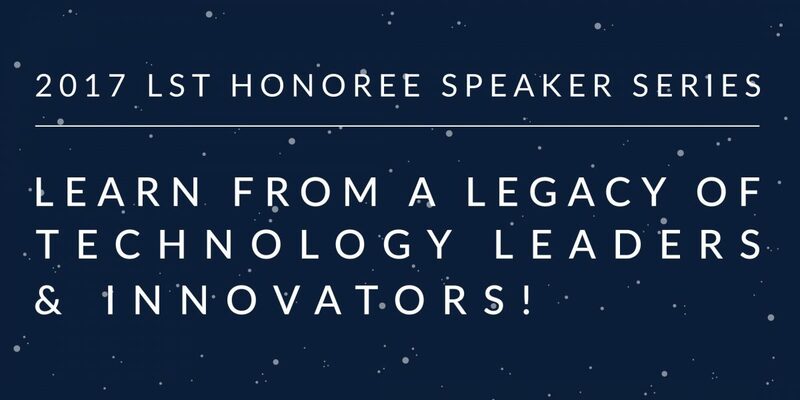 The LST Honoree Speaker Series is part of a run up to our annual benefit, the Leadership and Service in Technology Awards. Tickets are available now! Thank you so much to Judy Spitz for an unforgettable day! See the first part of this interview here! Welcome back! This is the second part of Judy Spitz’s incredible interview with Seidenberg student Niamh Fitzsimon. The event is the first in a series featuring previous winners of our prestigious Leadership and Service in Technology (LST) award. 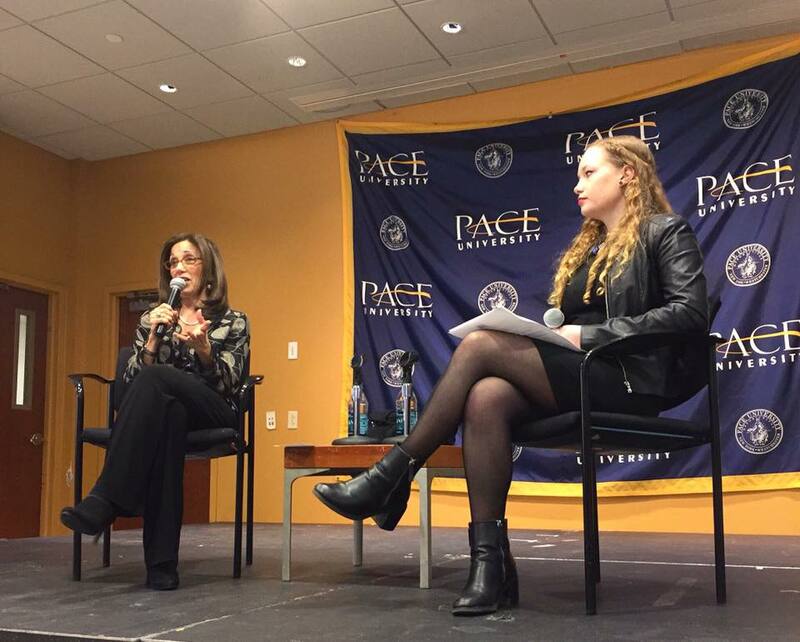 One of the topics that kept reoccurring during Niamh’s interview with Judy is something very close to our heart at the Seidenberg School: women in technology. Niamh herself is Vice President of the student organization Pace Women in Tech. She asked whether Judy found that being a woman ever played a part in how she worked with her teams. “No, it never changed anything that I did, one way or the other. I will say that there’s all this data that shows that women feel like they need to meet 120% of the job requirements to apply for the job. Men are in the 50-60% range. Don’t look at job ads and say oh I can’t do that part I shouldn’t apply for it. Men look and say ‘oh, I can do most of those things’ and that’s plenty. While on the topic of women in tech, Judy took some time to talk about how WiTNY came to be. The Women in Technology and Entrepreneurship in New York, or WiTNY initiative, aims to significantly increase the participation of women in STEM fields in the New York market. Through strategic initiatives, WiTNY mainly works on enabling high school girls preparing for college to focus on STEM paths and secure rewarding and lucrative careers within the tech field. 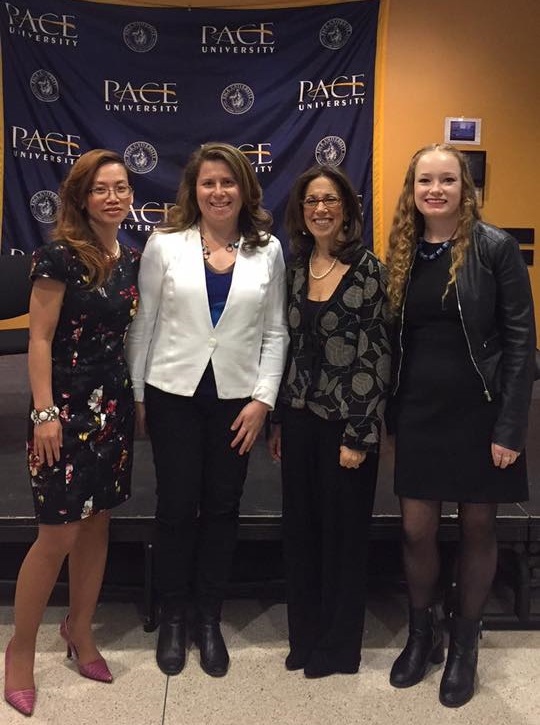 As an institution with our own Women in Technology initiatives, like STEM Women Achieve Greatness (SWAG) and Pace Women in Tech, we think WiTNY is a wonderful, extremely valuable project. Head to part 3 of Judy Spitz’s amazing interview here! Although it wasn’t planned, the fact that the first of our LST Honoree Speaker Series fell on International Women’s Day was serendipitous to say the least. The event was part of a run-up to the Leadership and Service in Technology (LST) Awards, an annual benefit for the Seidenberg School during which we celebrate outstanding individuals who best exemplify leadership and innovation in the tech field. This year’s award will be going to Suresh Kumar, Senior Executive Vice President and Chief Information Officer at BNY Mellon. Tickets can be purchased at various levels for this fantastic opportunity to attend the reception, network with industry professionals and alumni, and support the Seidenberg School. 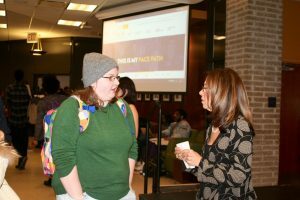 Judy Spitz is the Founding Program Directory of the Initiative for Women in Technology and Entrepreneurship in New York (WiTNY). 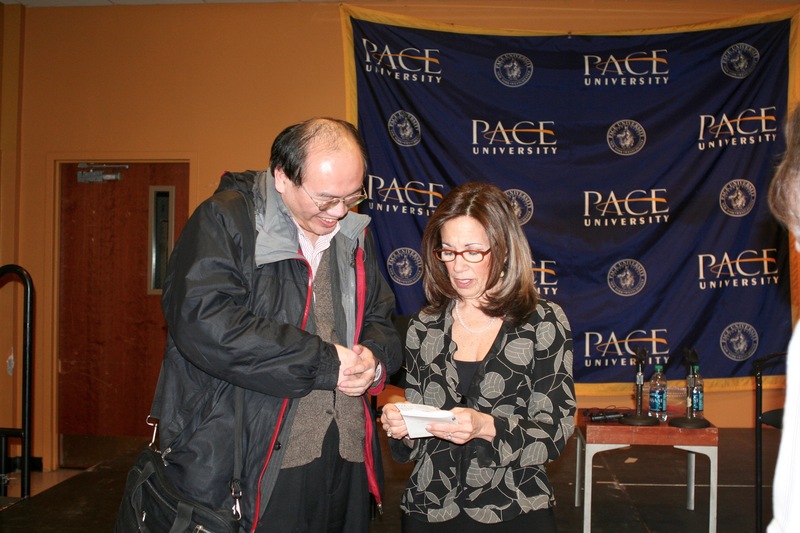 She received the LST award in 2012, when she was the Senior Vice President and CIO at Verizon. On Wednesday March 8, a crowd of over 100 students, alums, and friends from the Pace community got to hear an incredible interview where Judy shared the wisdom she has collected over an eventful career. Progress was a key theme of the event. As Seidenberg student Niamh Fitzsimon opened the interview by asking about Judy’s career and advice for success, it quickly became clear that being open to different paths of progress is crucial. Words many of our extremely driven, motivated students needed to hear. When you are so focused on following a strict career path to get to where you want to be, you could become blinded to opportunities that offer an alternative route to the end goal – or even ones that take you somewhere else entirely, somewhere that ends up better than your original plan. Judy also outlined her 5 steps to success. Given the 8 step plan offered by Amtrak CIO Jason Molfetas during his Big Data Innovator talk last fall, perhaps the first and foremost step should be “Come up with a list of steps”! 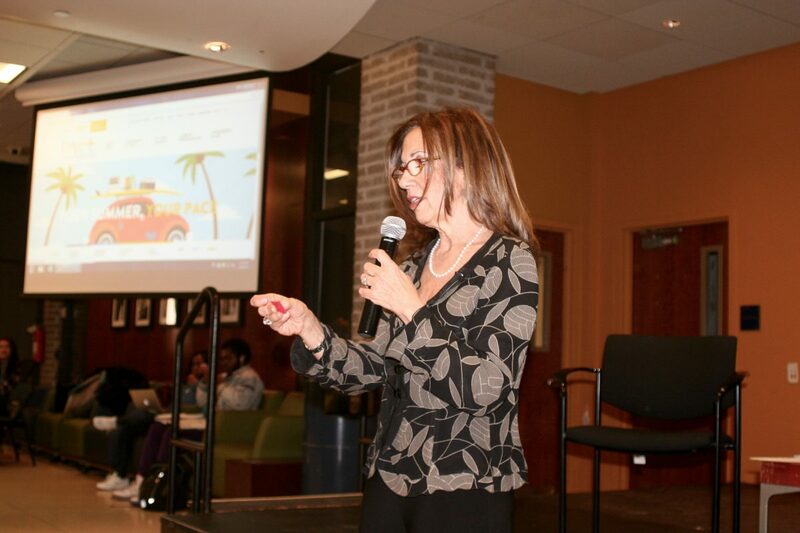 “It doesn’t matter where you are in your career,” Judy said, “Whether you’re at the beginning and you need talk to the people you work for about what you are doing and why it matters, or you’re middle management and it’s about collaboration with your peers, or whether you’re in a leadership potion and you need to motivate the people you expect to follow along, you’ve got to be able to tell a great story. “See both the forest and the trees: you have to be able to stand back and get the big picture so you can get an idea of what matters and what doesn’t,” Judy said. By seeing the big picture, you learn which smaller parts are the most important and can execute tasks in a way that makes sense on both the minute and grand levels. “It’s never about you.” As close as you can get to a project, sometimes the decision you want to make isn’t always the right one for the project. Remember that it’s not about you, it’s about the work. Continue reading part 2 of Judy Spitz’s interview here!